“We conceived the flagship store as a visual and dynamic journey,” explains architect and designer Matteo Thun, who together with Antonio Rodriguez is responsible for interior design and architecture across the entire flagship store. These two designers have been shaping the design of Zwilling products for 10 years now. On space totalling 640 m2 their store concept in Shanghai fuses western and eastern traditions with a purist and understated interior. Each area in the new flagship store has been individually designed from materials and colours to music – with the look of each zone varying dynamically. Overarching elements set the tone: natural materials and Mediterranean influences create a warm atmosphere within each space. Grey terrazzo covers the floor while light oak and dark walnut emphasise special areas in the flagship store. The light-flooded shop on the ground floor boasting retail space extending over 180 m2 places the products in the foreground thanks to purist design. The dominant materials here include wood, brass and steel. Behind a glass wall the shop then presents Zwilling’s knife range including a collection featuring rose gold steel blades. Display units in pale wood present cooking utensils, saucepans and accessories. 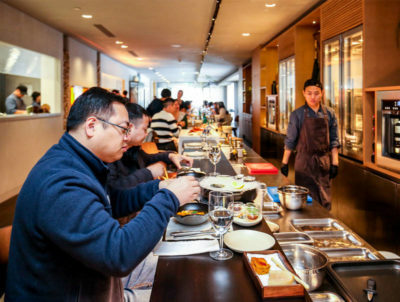 On the upper floor the design concept divides up the different areas of the restaurant and interprets the various food concepts using differing ceiling heights and different types of seating. 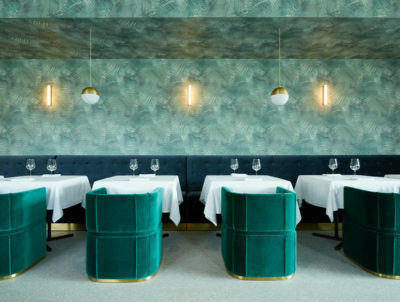 The fine dining area boasts petrol-coloured velvet seating. Brass hues create accents. Palm-leaf design wallpaper complements the overall design. A Mediterranean-style, 36m long wooden table invites diners to eat and creates a sophisticated setting with a rustic touch. 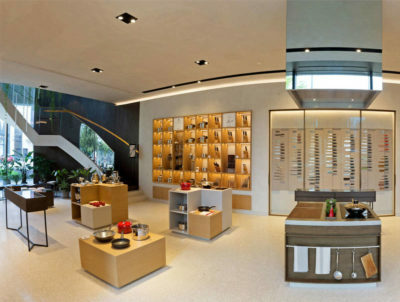 The incorporated cooking school is fitted out in dark wood, white marble and stainless steel. Zwilling’s aim here is to introduce customers to its products via this culinary experience. Consumers can not only purchase the products but also try them out and get cooking tips and training at the cooking school. Hamburg TV chef Cornelia Poletto was the consultant and gastronomic mind behind this gastro concept. 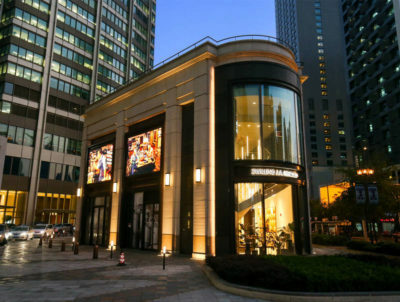 The flagship is Zwilling’s second store in Shanghai and the first store to feature the new concept.